Evolutionary convergence is so fun to learn about! Shore flies of the genus Ochthera are distinguished from almost all other flies by the presence of obvious raptorial forelimbs, held off the ground and used exclusively for grasping prey. We associate these kinds of limbs with Mantodea, the mantises, and one of the most notable flies in this genus even goes by the name Ochthera mantis, but these limbs have arisen several times in several different groups of insects for the same reason sharks and dolphins might have such similar body plans. They may not be directly related, but their environment has shaped them along similar paths through the trial and error of natural selection. You can see how easy of a jump these limbs are from any other insect foreleg, too. They really aren't all that heavily modified; a little fatter in places, a little pricklier, and just a little bit more hooked. They're a logical modification to a limb the little predator has been using to grab its meals for long enough, and if you look at other predatory insects, you'll sometimes find subtler raptorial adaptation in a fairly smooth spectrum between those that pounce prey with relatively unmodified appendages and those, like the true mantis, the mantidfly and the ambush bug to name a few more, that have turned their front legs into basically a set of tiny, spring loaded bear traps. 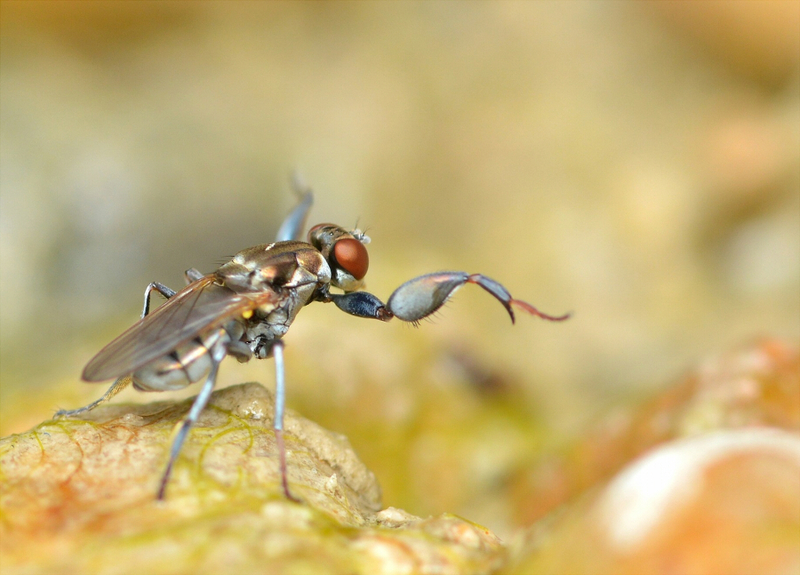 Beginning their killing spree from day one, Ochthera maggots are water dwelling carnivores, feeding on other aquatic insect larvae such as those of their fellow diptera, the midges and mosquitoes. Once they leave the water and mature, they continue to hang out along shore - hence the name - waiting to pick off such prey as adult midges and mosquitoes. 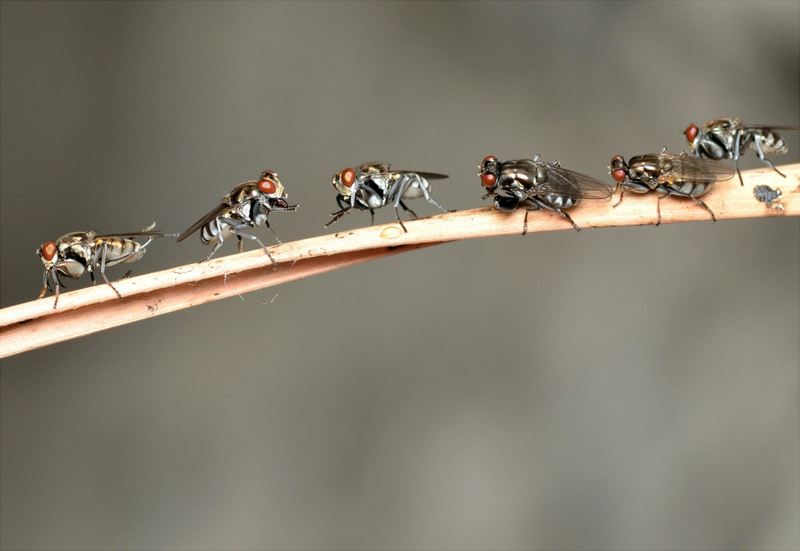 Since these flies barely wander from their birthplace, they inevitably end up spending most of their time surrounded by their own kind, and have come to develop a semi-social lifestyle. Individuals of all species have been observed greeting one another by spreading and waving their claws at one another before either mating, fighting, or continuing about their business, and they don't just seem to be comparing weaponry; it's believed they may also be showing off UV-reflective patches on both their claws and their faces, but without further research, we can't be certain, and we don't know exactly what it is they might be "saying" with these patches, though when it comes to mating displays, the male augments his claw signals with a rhythmic tapping of his hind legs against his abdomen. 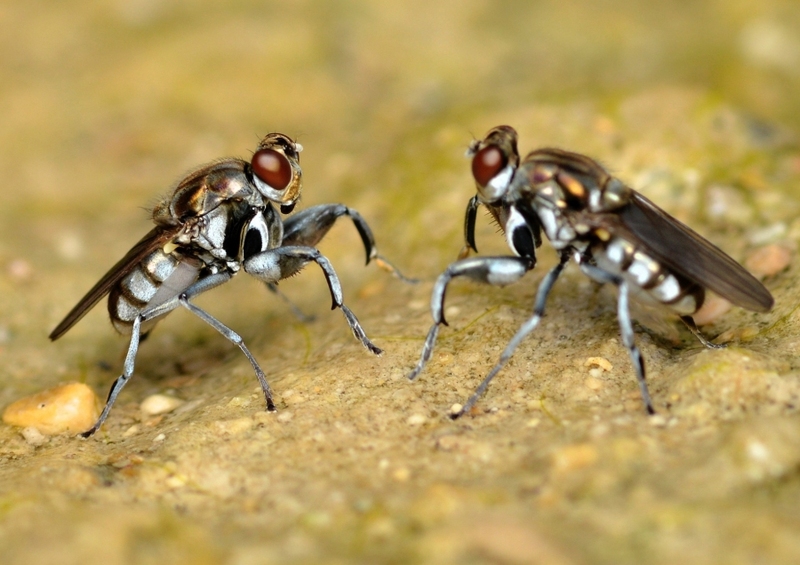 So, how do predatory flies actually eat? 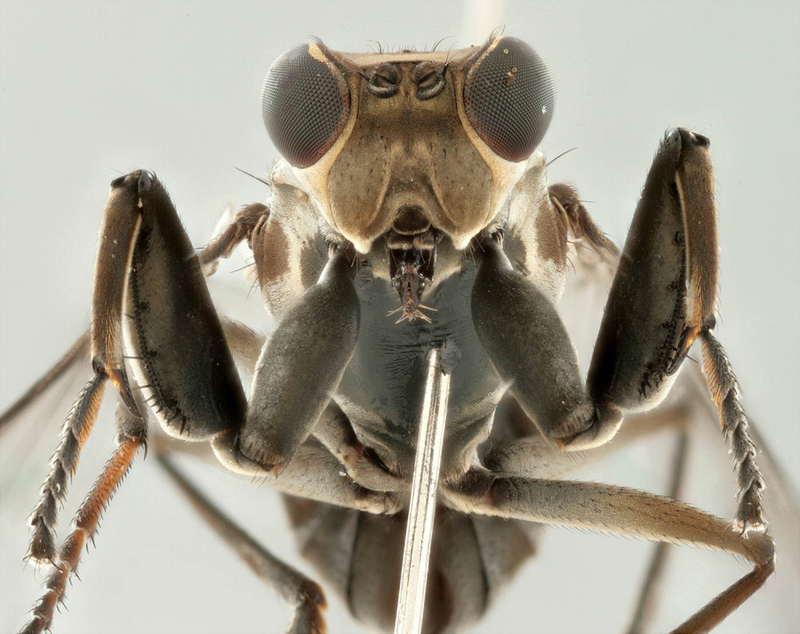 These are the first example we've explored for Flyday, and as you should know from our first entry, flies as a general rule do not have "chewing" appendages; only a proboscis for secreting and absorbing fluids. In insect-eating flies, the same proboscis is modified into a hard, sharp, usually fairly short "dagger" with saw-like edges, perfect for breaking through the tight seams of an exoskeleton. We already know that flies feed by regurgitating digestive juices and siphoning up the resultant sludge, so once they get their face-dagger into the prey's body wall, it's pretty much all over. The majority of an Ochthera's prey are, obviously, those midges and mosquitoes who naturally hang out in the same environments, but they'll go after just about anything they think they can overpower, and have even been observed actually digging for small, burrowing midge larvae in mud and sand, repeatedly inserting their proboscis into the ground to taste for the meal before digging madly, like a canine, with those same little front claws. Shore flies may just seem like another bug-eating bug, and an obscure one at that, but I think it's amazing to contemplate the horror story of what their prey has to deal with. Just imagine spending your infancy in a nursery where bigger, meaner babies devour the flesh of other, smaller babies, surviving more by sheer statistical odds than anything else until you finally morph into a grown adult, pretty much overnight. Then, for the first time, you step outside that horrible nursery... only to find row upon row of squat, red-eyed little men and women already waiting for you, every last one with a sickle in each hand.